Atrium ranch style house plans are a popular style that have developed in recent years. They are ranch homes built with walk-out basement foundations featuring walls lined with windows that connect both the lower level and the first floor. They are perfect for enjoying backyard views. The floor plans for these homes have an open feel combining the basement with the first floor. Atrium homes have all the living spaces on the first floor, but there’s a lower level accessible from a staircase that is designed within an atrium. The finished staircase and window wall create the feel of a finished lower level. 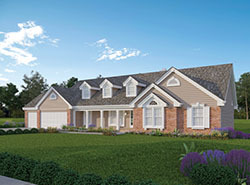 The Demarco Luxury Prairie Home has 4 bedrooms, 3 full baths and 2 half baths. 6658 Sq. Ft., Width 168'-8", Depth 77'-6"
The Cassidy Downs Craftsman Home has 3 bedrooms, 2 full baths and 1 half bath. 2165 Sq. Ft., Width 49'-0", Depth 40'-0"
The Cainelle Craftsman Ranch Home has 5 bedrooms and 3 full baths. 2898 Sq. Ft., Width 72'-0", Depth 60'-6"
The Baywood Shingle Ranch Home has 3 bedrooms and 2 full baths. 2345 Sq. Ft., Width 82'-0", Depth 64'-0"
The Owen Point Craftsman Home has 3 bedrooms, 2 full baths and 1 half bath. 4610 Sq. Ft., Width 45'-6", Depth 80'-0"
The Mayshire European Home has 4 bedrooms, 3 full baths and 1 half bath. 2716 Sq. Ft., Width 80'-7", Depth 93'-8"
The Layton Circle Ranch Home has 4 bedrooms, 3 full baths and 1 half bath. 2611 Sq. Ft., Width 59'-8", Depth 78'-6"
The Reid Falls Prairie Style Home has 4 bedrooms, 3 full baths and 1 half bath. 3307 Sq. Ft., Width 96'-6", Depth 66'-6"
The Murphy Bend Luxury Home has 5 bedrooms, 4 full baths and 1 half bath. 4784 Sq. Ft., Width 110'-6", Depth 84'-0"
The Paxton Peak Luxury Home has 3 bedrooms, 2 full baths and 2 half baths. 4531 Sq. Ft., Width 124'-9", Depth 92'-0"
House Plans and More's large collection of Atrium ranch house plans offers detailed floor plans that allow the buyer to understand what the home will look like right from the start. With a wide variety of Atrium ranch home plans, we are sure that you will find the perfect home design to fit your needs and lifestyle.